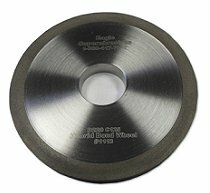 Vitrified Bond Grinding Wheels Supplier | Eagle Superabrasives inc.
Eagle Superabrasives is a premier manufacturer of vitrified bond grinding wheels. With an extensive inventory of over 6,000 Diamond, CDX and CBN wheels at our Hickory, NC location, we can usually ship ninety-percent of our products the same day. In addition, our experienced staff will provide you with superior customer support and service. They will deliver prompt, insightful technical support and advice on any product you purchase. We offer our CBN and Diamond wheels with vitrified bonds. Vitrified bonds allow the wheel to be very rigid, strong and porous. These characteristics, each provide many benefits to the wheel. Having a rigid wheel allows for a strong cutting performance, increased grinding speed. Another added benefit of the vitrified bond, is its porous character. The porosity of the wheel allows coolant to penetrate between the work piece and the wheel to effectively remove heat from the point of contact and we all know that any reduction is heat generated while grinding will extend the life of the product. While vitrified bonds are very strong, they are brittle like glass and require consideration when using to pressure to grind. CBN vitrified bond grinding wheels increase performance of grinding operations. The body remains wear free by taking advantage of the high thermal conductivity of CBN and the vitrified bond. Another added benefit using of incorporating a vitrified bond, is that it is easier to dress than a resin or metal bond. Vitrified bond grinding wheels yield the best result for machining with high-precision components. If you’re looking for high-performance grinding wheels, vitrified bonds can be specially designed to utilize CBN and Diamond as the Superabrasive.